Not to put too fine a point on it, but timing is everything. We cruisers live in a world of scuttlebutt! Really. Rumor, third hand information, and I read it somewhere, are our currency. After all we’re trying to get accurate information about a local bureaucracy in a foreign country who applies rules as capriciously as Putin follows election laws. You ask why? Like we all knew in the 60s the truth is silly putty, and getting hard true information is nearly impossible, so in lieu of anything concrete we make it up, more or less. For years we heard the rumors flying around about large fines levied on cruisers that fetch up at Fatu Hiva without first clearing in at Hiva Oha. Beautiful Fatu Hiva is a little closer and easier to see first in French Poylniasa because of prevailing winds. Last year’s scuttlebutt seemed to indicate that the authorities weren’t really checking for or at least fining, what anyone would say was a small indiscretion. We spent six days there recovering after sailing forty two days just to get there, and it would be hard to find a more beautiful, quiet, or less officious place on earth. Still, there were rumors that they had someone writing down boat names for the Gendarmes in Hiva Oa! 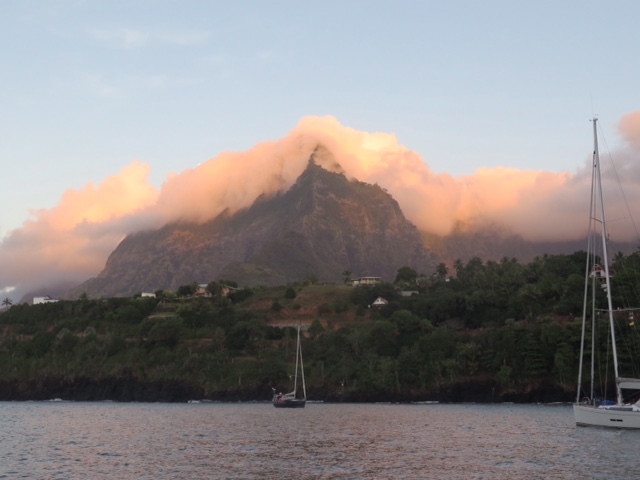 So, as I was saying, after a boisterous forty two mile sail up to Hiva Oa we were asked to anchor outside the harbor because a French “warship” was coming in for a few days. Sure enough a big gray thing shoe-horned itself into the quay and we waited outside for awhile but eventually snuck into the anchorage and hid. The next day their customs boat approached and the usual half dozen beefy French uniforms were poking into every nook and cranny on Escape Velocity while two guys filled out sheets and sheets of forms. When asked, we answered truthfully about arriving first into Fatu Hiva, and they didn’t seem to care. That completed, they smiled and with a cheerful au revoir they left. Later that day the big gray thing smoked it’s way out of the harbor and out of our minds as well. Soon harbor neighbors from Fatu Hiva started arriving with stories of a rare harbor sweep out of a large gray thing, the morning after we’d left. The sweep featured $200 fines but apparently they’d take whatever cash you had. Pure luck on our part but when the dead pig floats past your boat, you gotta go.